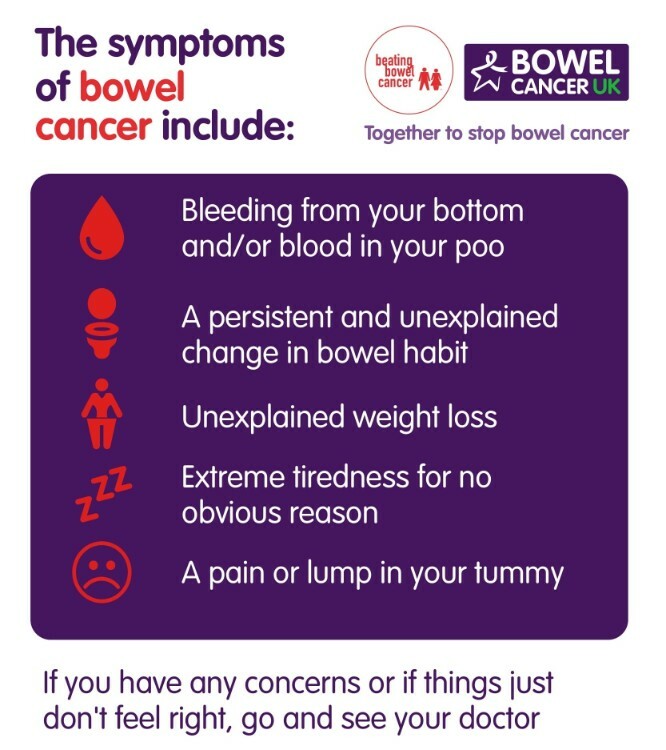 A quarter of people (25%) only named one of the five most common bowel cancer symptoms and more than 1 in 3 people (35%) were not aware of any symptoms at all, according to a poll of 4,000 UK adults commissioned by the charity. Men are less likely than women to recognise any bowel cancer symptoms with nearly half of UK men (45%) unable to spot any signs of the UK’s second biggest cancer killer. We commissioned a YouGov survey to gauge awareness of the symptoms of the UK’s fourth most common cancer. In April alone nearly 3,500 people will be diagnosed with bowel cancer and over 1,300 people will die of the disease. Being aware of key symptoms and visiting your GP if things don’t feel right can help increase chances of an early diagnosis. Bowel cancer is treatable and curable, especially if diagnosed early. Nearly everyone diagnosed at the earliest stage will survive bowel cancer but this drops significantly as the disease develops. Early diagnosis really does save lives, but only around 15% of people are diagnosed at the earliest stage of the disease. Former Everton midfielder Kevin Sheedy is backing the charity’s campaign to raise awareness of bowel cancer symptoms as he was diagnosed with the disease in 2012. He says: “I noticed I was going to the toilet a lot more and then I started finding blood when I went for a poo. I remembered listening to an awareness advert I’d heard on the radio and I knew I had to book an appointment with my GP urgently. Deborah Alsina MBE, Chief Executive of Bowel Cancer UK and Beating Bowel Cancer, says: “Every day I hear from families about the devastating effects of a bowel cancer diagnosis. Our vision is that by 2050 no one will die from bowel cancer, and raising awareness of the symptoms is a key step to achieving this.